Nerdcenaries: How are you doing? Ramon Villalobos: I’m doing alright. Nerdcenaries: Well, you got done with your What If: Age of Ultron issue and you are doing Young Avengers next but I think there was something else you had that came out recently. Am I mistaken? Ramon Villalobos: Yeah a book called Abstract 3 that my friend Frank is inking for me, written by Seth Jacob. Nerdcenaries: What is it about? Ramon Villalobos: Well it’s about a group of superheroes called the Abstract 3 that have a reality warping crisis but I can’t really talk much about the plot. Nerdcenaries: Ah. Well it has your art on it which is a solid selling point. Ramon Villalobos: Haha thank you. Nerdcenaries: Your style to me kind of seems like a Rafael Grampa crinkly-ness meets the sharp cleanliness of Mike Allred. Were either of them inspirations? Ramon Villalobos: Definitely both of those guys are yeah. Probably Rafael Grampa is a little more apparent in my art. I like the really classy grit in his drawing. Allred I really like because he kind of has some of the quirky silver age stiffness that I really dig but it’s not as conscious of an influence as is Grampa. Nerdcenaries: Is there sort of a dream comic you’d love to see either of those guys on for the art? Or an Allred written, Grampa illustrated series? Ramon Villalobos: Probably Doom Patrol for either one would be amazing. Or the Demon for Grampa and like a 60s Spider-Man story for Allred. I think by this point I’m just saying things I really want to do though haha. Nerdcenaries: Haha. I’d be opposed to none of those. When it comes to writing, is what you normally get asked to illustrate different than what you prefer reading? Ramon Villalobos: No, not really. I think I’ve sort of put enough bait out into the void about what I’m good at doing and the kinds of things I like that usually like minded writers see that and make the connection that I’d be perfect for that idea. It probably used to happen more when my style was a little less individualistic. Also, I’m not really afraid to just say no to things I can’t see myself doing a good job with. Nerdcenaries: That can be a pretty important skill, especially starting out – both for writers and artists. Ramon Villalobos: Well that’s a little hyper specific but definnitely, if you want to draw Star Wars stuff, show that you can draw cosmic stuff and that sort of thing. Brand yourself. I love wrestling so I draw wrestling and then opportunities arise for me to get paid to draw wrestling stuff but I don’t think drawing John Cena will make the WWE hire me for anything. Nerdcenaries: Haha, yeah, It can very between markets and industries. So what comics are you currently enjoying, old or new? Ramon Villalobos: Haha oh man, I’m so out of touch with most new stuff. I trade wait almost all new stuff and have a big pile of things I just haven’t found time to work through. I try to read a lot of like… just regular books when I’m not drawing. Been reading this book Paradigms Lost: Images of Man in the Mirror of Science. It’s pretty cool. But yeah, like Wonder Woman is the most recent of anything that I’ve read. I read Young Avengers before starting this recent project. That was cool. Oh, I also got some Reggie and Me comics. I like those. Reggie is the purest agent of chaos in all of comics. Nerdcenaries: Since you are going to be doing art for the Young Avengers miniseries with Ryan North, have you just been reading the recent stuff by Gillen and McKelvie? Ramon Villalobos: Yeah, I they gave me the first 15 issues. Cool stuff. Nerdcenaries: Who is your favorite member of the team? Ramon Villalobos: Marvel Boy but that’s because I loved that series with Morrison and JG Jones so a lot of that carried on from other things he’d been in. 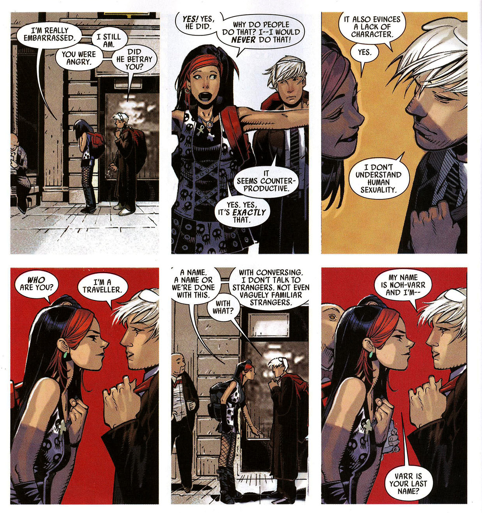 Bachalo and Bendis did a sweet one shot with him awhile back that is really sweet. He’s just cool as hell. Nerdcenaries: Oh yeah, the Dark Avengers one? Ramon Villalobos: Yeah, the annual. They went in on that. Nerdcenaries: Yeah. Though even better was Dark Reign: The List: Wolverine by Jason Aaron. It was really Marvel Boy’s only other big moment in Dark Reign which was sad since he is an interesting character. Ramon Villalobos: yeah, that was the first time Chris Bachalo did white gutters with no panel borders, it blew my mind. Made it look so clean and fresh for some reason. Similar to how Quitely uses all black gutters in Batman and Robin and We3 and it gives a weird cinematic quality to it. Nerdcenaries: Yeah, they also did the black borders in a lot of Ultimates Comics when they wanted the cinematic feel as well which is kinda crazy because you are making comics, make comic stuff that you can only do in comics. 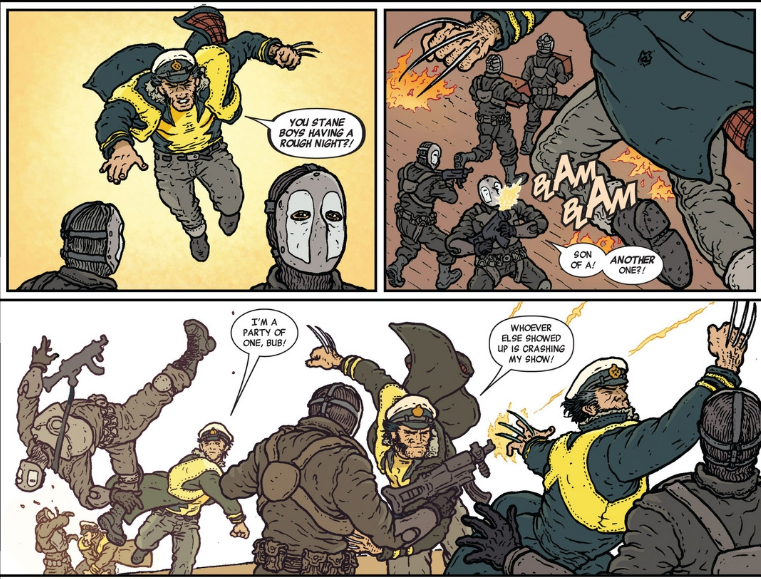 Ramon Villalobos: that’s still something you can only do in comics when you subvert it the way Quitely does. In that you can change the dimensions of the screen and make it not even be rectangular at a moments notice. It’s just another approach to comics, its not trying to be movies. Nerdcenaries: So where can people find you on the internet? Ramon Villalobos: @ramonvillalobos on twitter, facebook.com/ramonvillalobos on facebook, ramonvillalobos.tumblr.com on tumblr, @thelastramon on instagram um… my website is newcoolmeat.com but that just direct links to tumblr. Nerdcenaries: Thanks for taking the time to do the interview Ramon!